Explanation: This color "picture" of globular star cluster M55 may not look like any star cluster you've ever seen. Still, it shows a most fundamental view for students of stellar astronomy. 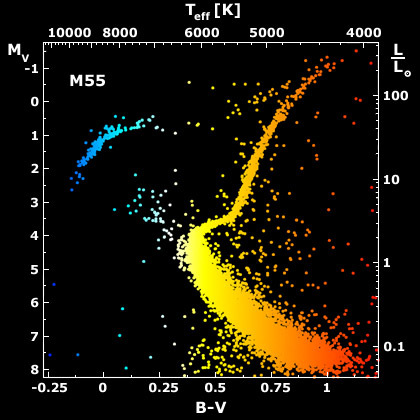 In the picture, a Color Magnitude Diagram (CMD), M55's individual stars are represented as dots whose color indicates relative temperature, red (cool) to blue (hot). Position in the CMD does not correspond to a star's location in the sky, though. Instead, it corresponds to a measured astronomical color, (B-V color) read off the bottom scale, and a brightness in magnitudes (M) on the left hand scale. The temperature for each star can also be found by reading the equivalent scale at the top, where the Sun would have a temperature of 6,000 kelvins (K). Brightness relative to the Sun's luminosity (Sun = 1) is given on the scale at the right. The globular cluster stars clearly fall into distinct groups dramatically visible in this CMD. The broad swath extending diagonally from the lower right is the cluster's main sequence. A sharp turn toward the upper right hand corner follows the red giant branch while the blue giants are found grouped in the upper left. M55's stars were formed at the same time and at first were all located along the main sequence by mass, lower mass stars at the lower right. Over time, higher mass stars have evolved off the main sequence into red, then blue giants and beyond. The exact position of the sharp turn-off from the main sequence to the red giant branch measures the cluster's age.